Using a sugar love spell are simple, effective and fun… I adore them! After you read this spell, please check out my simple sugar wish spell! This spell was sent in by Ravana. You can send in your spells ([email protected]) and a free gift! Just email me for the details. Using sugar in magick is great and very effective. Sugar like honey, is use to attract favorable circumstances and to “sweeten ones life” per say. 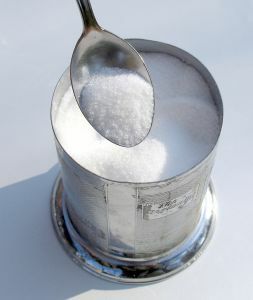 Some people use this spells like this sugar love spell when fighting with an spouse, friend, family member or whomever. You put your name and the person whom you are quarreling into a sugar bowl and visualize making up and/or resolving the issue with that person. Simple but cool magick. Chocolate, sugar, candy, honey and other natural sweets have always been associated with love and can work wonders in love magick. Most of you have heard of the honey love spell right? The thought of the taste, the sweet, the love, corresponds beautifully with love and sugar spells. Some people even use brown sugar for use in home made incense to bring luck. So use your mind, and you individualism and really make your magick or food magick as some people call it work for you. There are people who use magick to bake brownies and sweets for a loved one, and as they are making their concoction they visualize the outcome they want. Food is the quickest way to the heart and can make magick happen for your love life! Want to learn more about Wiccans in the kitchen? Read this Awesome article: Wicca in the Kitchen by Kitty the Dreamer. Sugar: a Wiccan food for Wicca in the kitchen that is ruled by Orishas and Venus. When powdered, sprinkle sugar on pink or red love candles to draw someone’s attention. So now I bet you are dying to find out about this powerful and wonderful sugar love spell. Without further ado, here it is! Write his or Her name 9 times on the red paper heart. On the back of the red paper heart write the message you would like to send. Something simple like ‘call me’, ‘im sorry’, ‘please forgive me’, ‘miss me’, seems to work best. I think its because its easier (at least in the beginning) to send simple energy messages or thoughts. Once you write your message, fold the paper heart in half and then place it standing up in the jar. Try the stand the heart up in the container but this isn’t always possible. Cover the heart with sugar, honey or candies. Place the jar onto your altar and then spend sometime meditating on the outcome you desire. See the person doing the exact thing you want them to do. See it vividly and with as much detail as possible. Ask the Goddess to aid you in your wish. Keep the lovers jar somewhere safe for as long as you need it. This spell can be done during any moon and/or day but its traditionally Friday for love spells, although some circles prefer Wednesday or Sunday for love spells and relationship work. Do you know a sugar love spell? Has this Spell worked for you? Do you use sugar in your magick? Leave me a comment below and tell me what you think! I have plenty more spells so if you need a sugar love spell check the other spells out in this section!